Pulse perforation-selection of pulsed laser with high peak power to melt or vaporize a small amount of data for the laser die cutting machine. Air or nitrogen is often used as an auxiliary gas to reduce the expansion of pores due to exothermic oxidation for the laser die cutting machine, and the oxygen pressure is lower when the gas pressure is cut for the laser die cutting machine. The above situation is the first consideration of the elements that present burrs when cutting low carbon steel of the laser die cutting machine, but it does not simply accelerate the cutting speed. Due to the speed of addition, the sheet is not cut and worn, and the condition is in the processing of aluminum-zinc plate. Especially outstanding for the laser die cutting mahine. This is because the machine tool does not adopt the method of blasting perforation when processing small holes when the laser die cutting machine working, but by pulse perforation, which makes the laser energy gather too much in a small are for the laser die cutting machine, and burns the non-processed area to form the deformation of the hole. , affecting the quality of processin of the laser die cutting machine. This condition can affect the quality of the cut section finish of the part of the laser die cutting machine. At this moment, under the condition that other parameters are normal, the following conditions should be considered: the loss of the laser head nozzle NOZZEL should be replaced in time for the laser die cutting machine. 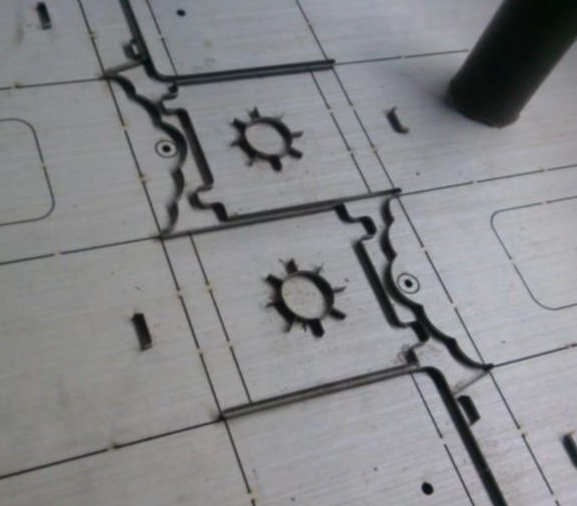 In the absence of new nozzle replacement, the operating gas pressure should be increased; the thread at the junction of the nozzle and the laser head is loose for the laser die cutting machine. < Do you know the type of laser die cutting machine?